Looking for answers? Here’s some of the most common questions and answer! Â If you don’t find what you need, please feel free to use the Contact page from the menu to contact us! How can I contact The Great Plains Renaissance Festival? Please note: Before you make your final purchase, carefully review your selections. We do not offer refunds for any tickets purchased. Tickets purchased on this site are non-refundable. Please be sure you have selected the correct tickets and the correct number of tickets before completing your purchase. The Great Plains renaissance Festival does not offer cancellations, refunds, rain checks, or exchanges. Yes. 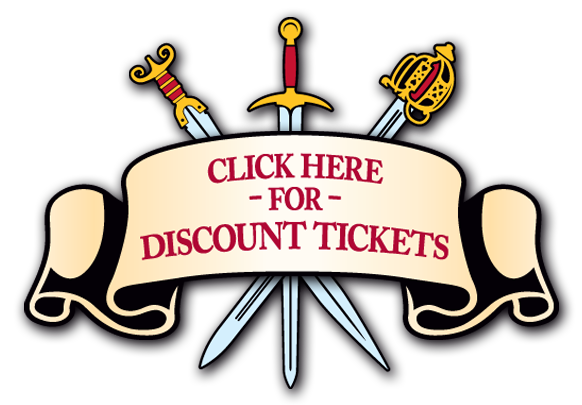 The tickets for the Spring Great plains Renaissance Festival are good only for the dates of April 13th & 14th, 2019. Will my online advance ticket purchase be mailed to me? No, you will pick up your advance ticket purchases at the Will Call table at the festival main gate. How do I purchase my tickets online? Can I still visit if I've misplaced my advance ticket? We are unfortunately unable to replace lost or stolen tickets purchased from advance ticket locations. For tickets purchased online, you only need to give your name at the “WILL CALL” window to receive your tickets. How do I get to The Great Plains Renaissance Festival? Select “Directions” from the menu above under the “Information” menu item. If you need to make an adjustment, please contact us as soon as possible at (316) 253-3392, 8:00 a.m.â€“ 10:00 p.m. Monâ€“Fri excluding holidays. No outside food or drink (including alcoholic beverages) are allowed to be brought into the festival. Can I bring my sword to The Great Plains Renaissance Festival? Provided your sword is peace-tied, yes. Make sure that your blade is properly bound so as not to be drawn by anyone else. You may not draw your blades or medieval replica weapons at the festival. Exposed blades and weaponry are expressly forbidden. Violators will be asked to place their blades/replica weapons in their vehicle or will be expelled without refund at the discretion of the festival staff. Can you smoke at The Great Plains Renaissance Festival? For the health and safety of our guests, performers and animals, smoking is only allowed in the designated parking areas outside the main gate and fenced areas. During your visit, you’re welcome to take photos and video for your personal use only. Many performers, vendors, and even attendees love to have their pictures taken! But, please ask for permission from a parent when taking pictures of someone else’s children. Commercial photography is allowed only with prior written permission from our Marketing/PR department. Can we bring pets to The Great Plains Renaissance Festival? Service dogs (guide dogs for the blind, working dogs for people with disabilities) are permitted at the festival. The festival does allow dogs on leashes. Please be considerate and pick up after your dog. We reserve the right to remove any dog or owner that is disrespectful to others. How long does it take to see The Great Plains Renaissance Festival? An average visit to the festival lasts 3 to 4 hours, but you can easily spend the whole day here and still have more to see! With the introduction of The Wichita Highland Games as a part of the event – which you get access to with your Great Plains Renaissance Festival ticket – it nearly doubles the amount of stuff going on! Yes, we offer group discounts for groups of 20 or more. We also offer special rates for school groups. Call 316 253-3392 for more information or e-mail us at eaglesrealm@swbell.net. 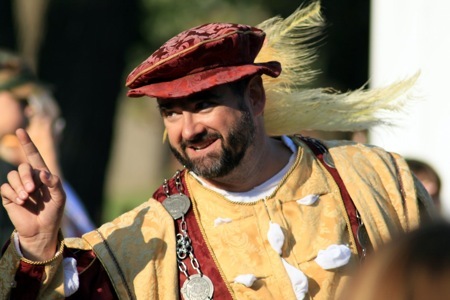 Do you accept personal checks at The Great Plains Renaissance Festival? We accept personal checks, cash and money orders. We cannot except credit cards. We’re sorry for any inconvenience this might cause. However, there is an ATM cash machine located outside the main gate. Thank you for understanding.